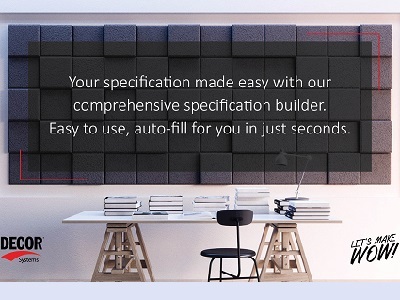 Decorative and acoustic panels specialist Decor Systems presents an online tool designed to simplify your specification process to just 4 easy steps. Designed for architects, interior designers and specifiers, Décor Systems’ comprehensive Specification Builder offers a simple interface with auto-fill to help the user complete the process quickly. Select your preferred product from the Product Range tab on the Décor Systems website. Click on the Build Your Specification tab provided on the selected product page. You can fill in the details of your project as well as select the substrate, panel size, finish, edging, joint, return, fire rating, Green Star rating and installation requirements for your selected product. Under Options, select as many options as required to complete your specification. Make your specification watertight and check (if required) the fields for Substitution Allowance and Completion Certificate. You can also request for a copy of your responses before submitting the form. Try out the Specification Builder.